I apologize if this has already been posted, but this link contains amazing pictures of the Chaiten Volcano Eruption and the accompanying lightning display. Last edited by nick c on Mon May 02, 2011 6:33 pm, edited 2 times in total. This volcano is going to play merry hell with the man-made global warming stats. Shades of St. Helens (U.S.). Very reminiscent of Portland, Oregon back in the day. I remember my wife at the time and I walking home the evening of the day the ashfall hit ... completely surreal. And no face mask thingamajiggie, just an umbrella. Came across a mewing, tiny black kitten, appearing just slightly freaked and huddled beneath a shrub along the way so we took it home with us. Hazy recall now, but must have been 2-3 inches of grey ash on the ground. I may be waffling but the Chilean volcano is roughly antipodal to the area that the Burmese cyclone originated from. A possible connection? On Saturday, April 12 (19,45 hrs), a huge fireball swept down over the Chacarilla Hills that encircle Santiago, Chile’s capital city. Researchers of these phenomena that witnessed the event were able to take photos, and promptly e-mail them to diverse forums. Then, I wonder...could this be related to the Chaitén eruption that began on May 2? Reports from Chile indicate that the very same day a second volcano, the Mochimahuida, some 40 kilometers to the south of Chaitén, began erupting after having remained dormant for almost two centuries. The Chaitén had last erupted in 7420 B.C., or 9,370 years ago, according to the Chilean National Geological Survey. WOW weird pics!!! beautiful I'm speechless!!! Just got word from Chile that the Machimahuida report was a mistake. People who saw a great column of smoke thought it was a second volcano erupting, but pilots from the National Emergency Office flying over the region were able to corroborate that the reported smoke column was part of the Chaitén eruption. Still, friends writing from Chile speak of a large scale disaster. They say 2 or 3 generations will pass before lands in the area become fertile again. “It is reasonable to point out that our Planet will soon be experiencing these new conditions of growing energy signifying the transition into a new state and quality of Space-Earth relationship. The living organisms of those regions of Earth having the major "inlets", or attractions, for cosmic influences will be taking the lead in evolving life's appropriate reactions, or processes, to these new conditions. The most significant of these areas are the helio-sensitive zones which have intense responses to geoeffective solar activities; responses that include the very dramatic and unusual manifestation of non-homogeneous vacuum, or classical non-mechanical ether, domain structures. We only have to think of the August 15, 2007 earthquake in Peru (8.0 quake, epicenter in Peru's southern desert, at the boundary where the Nazca and South American tectonic plates meet) when the spectacular display of lights in the sky generated by the tremors, were seen as far as the capital city, Lima, some 200 Km up North. Nobody could explain the fantastic lights, but I think the answer lies in Dmitriev’s Planetophysical Function of Vacuum Domains, an essay in which he delves fully into a subject included briefly in the previous article, that of the physical vacuum (PV), "a non-homogeneity or a local modification where electrodynamics and gravidynamics are coupled. Vacuum domains in the model possess a set of specific features which include penetration through any kind of matter, where VD's introduce electric, magnetic, gravitational, spin fields and the distributed angular momentum." Inside VDs, Dmitriev explains, "penetrating gravispin waves (gravitons) are transformed into electromagnetic waves (photons)." "To all Earth shells, from magnetosphere to mantle, the VDs bring electric circuits and discharges, magnetic variations and pulses, mechanical stresses and changes in the velocity and intensity of chemical reactions in atmosphere, heliosphere and lithosphere: all these phenomena being unexplainable by classic theories." "VDs are localized in lithosphere in the conductive and elastic media, where they may produce pulsed heat release (such as "contact heat explosions" forming kimberlite pipes) and produce enormous torsion stress affecting the nature of tectonophysical processes and the seismic regime of the Earth." 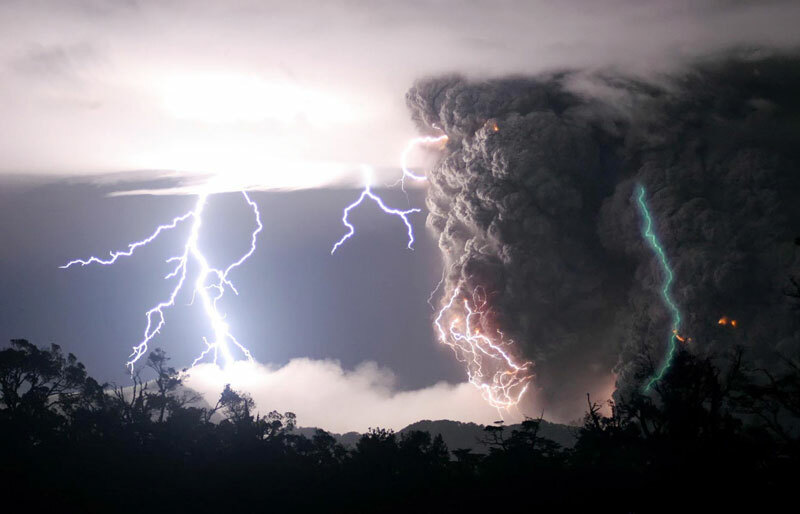 "VDs are identified with manifold natural self-luminous objects of different kinds, such as ball lightnings, "plasmoids", poltergeist, tornadoes, "angels", "small comets or atmospheric holes", ionosphere and atmospheric explosions, ithosphere explosion tubes, "sprites", the glows connected with the earthquakes and the volcanic eruptions. Sandra Rodriguez wrote: Just got word from Chile that the Machimahuida report was a mistake. People who saw a great column of smoke thought it was a second volcano erupting, but pilots from the National Emergency Office flying over the region were able to corroborate that the reported smoke column was part of the Chaitén eruption. Interesting... Thanks for the update! Merged all Chaiten eruption posts into single thread, including the erroneous report of a second volcano and th subsequent retraction. Is there any significance in the differing colours of the lightning bolts? There's the blue one on the far right, then the orange beastie that's wrapped itself round the base of the pyroclastic plume and appears to be exiting (or entering) at the top. There's a violet, y shaped branch right in the centre and the large (positive) bolt to the left has whited out the camera...so I'm going with white! I don't know if it's the different conductive medium or even the different backdrop. Does the cloud deck in the picture correspond to the actual cloud deck (around the centre of the troposphere), or is it the sliding along the bottom of the stratosphere in the same manner as the anvil part of a Thundercloud? Most of the lightning, including the large bolt to the left, seems separate from the volcanic plume. Doesn't this fly in the face of accepted theory i.e. 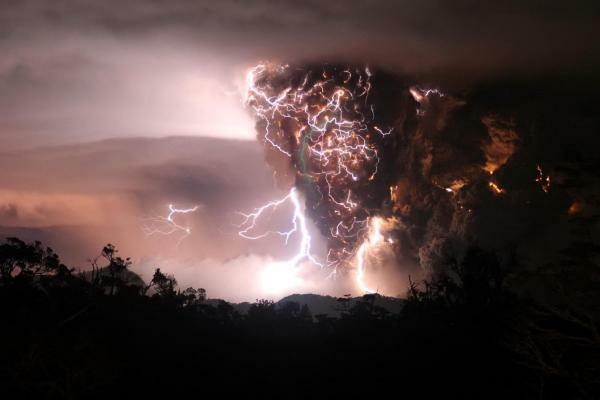 that volcanic lightning comes from the "static" charge accumulated by particles in the plume? Also, is this image too big for the forum, cos I'll swap it for the original link if it is.